Well, it’s been a couple of weeks since I’ve been back from The City, but I’m finally getting around to dishing about my trip. (Thanks 10-hour work days for getting in the way.) I don’t even know where to begin. 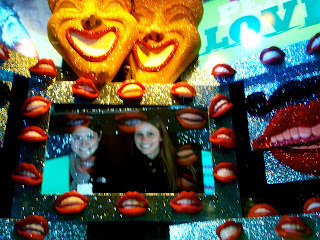 I had the BEST time with my BEST FRIEND, Dana! I’d have to say though; my least favorite part of the trip was having to drive an hour and a half to the airport at 3:30 in the morning!! WHAT?! Am I crazy? I was nervous I was going to be way too tired because B and I spent half the night talking and laughing—I was so wired with excitement; but any way, thank goodness for adrenaline because that’s what got me through the drive. That, and John Mayer’s new jams. Apparently it was supposed to be rainy the entire time I was visiting (Thursday-Sunday), but I must have brought the Florida sunshine with me because it was gorgeous weather! Cold, but beautiful. 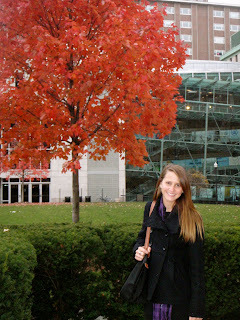 I couldn’t resist taking a picture with this tree. I don’t get to see this EVER in Florida. This was taken at Columbia University. 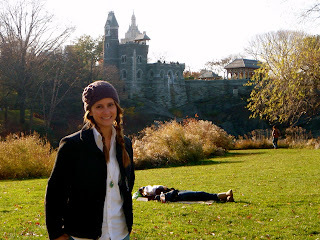 I’ve been to New York a few times, but I never got a chance to go to Central Park. This is where a scene from the movie “Enchanted” was filmed. Again, I can just swoon over these leaves. LOVE IT! 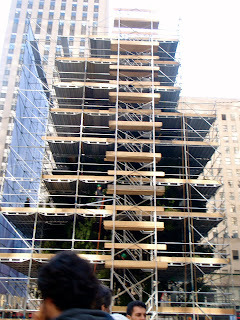 I was a little early for the revealing of the tree, but here it is being put together. Pretty cool! 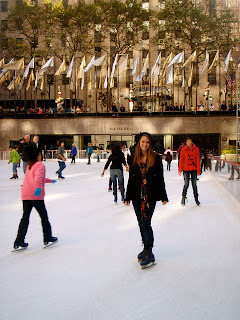 AND we went ice skating at Rockefeller Center… definitely a fun (but pricey) experience. 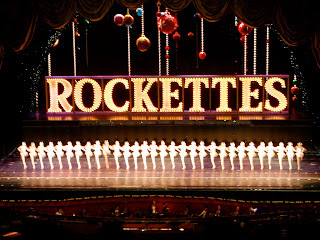 Yes, the ROCKETTES! It was Dana’s birthday gift to me. Oh, how I love her =) They were awesome, by the way, but I wouldn’t expect anything less than perfect from these leggy ladies. I’ve seen the Rockettes on TV, but it doesn’t do them justice. 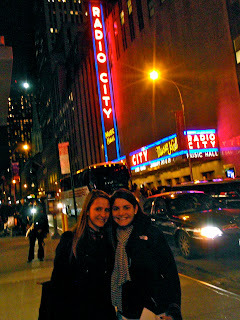 There’s nothing like seeing them live at Radio City Music Hall. Hey, we’re in the window display at Bloomingdales! Bloomies was the only one who had their Xmas displays revealed when I was there. 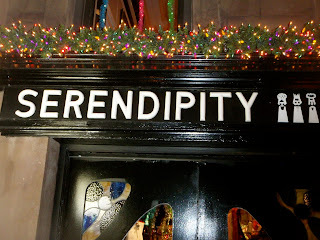 We ate at “Serendipity” from the 2001 movie with John Cusack and Kate Beckinsale. 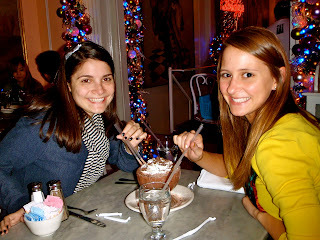 They’re notorious for their frozen hot chocolate. Oxymoron, I know, but let me tell you… it was the best thing I’ve ever tasted!!! I can’t even explain how delectable it was! 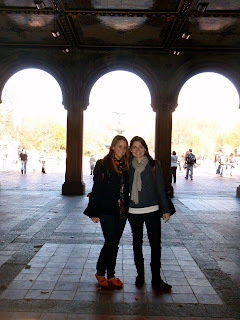 Central Park, again. We rushed our first visit to Central Park because we didn’t want to be late for ice skating and The Rockettes, and since we had some time before I had to go to the airport, we picnicked in the park. I could come here everyday. It’s prime for people watching (a favorite pastime of mine—LOL). 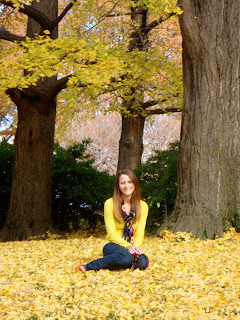 Again… these trees!! I’m so jealous. 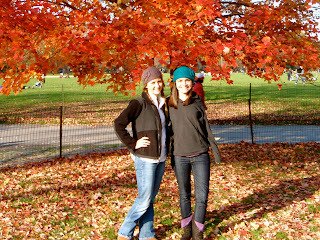 I’m so thankful for my best friend for showing me the best time in New York. I couldn’t have asked for a better trip. One thing I didn’t get to do and I was extremely disappointed about was visit my Grandmother’s grave. She passed away at 91 years of age when I was in 9th grade. I set up a car service to take me there before taking me to the airport. I didn’t even think about calling to see if the cemetery was open, but my dad suggested it at the last minute and sure enough, it was closing in fifteen minutes when I called. UGH! I wanted to cry. I was so sad I wasn’t going to be able to visit her. On the bright side, B and I are talking about taking a trip up to NY this summer since he’s never been and I know she’ll still be there. More bright news… when I went home to my parents for Thanksgiving, my dad let me have her wedding band. And that, I am happy and thankful for. I love that you went ice skating at Rockefeller Center!! And you are just so flipping cute in all your pictures …. too bad we both missed the tree lighting by a week! 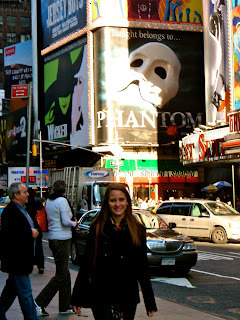 I'm jealous…I really want to visit NYC! That trip looks SO fun!!! 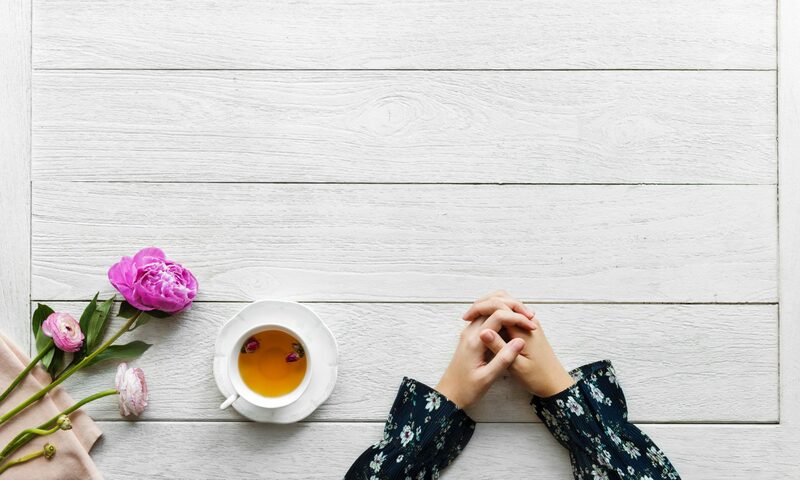 Hope you can stick around the blogging world! Miss ya!